Land grabs: Nearly 750,000 people have lost their homes and land since 2000, according to a brief filed at the International Criminal Court. Decent Work: Garment workers – who produce shirts, trousers and more for well-known brands – make just US$100/month. They are fighting for a living wage of US$177, yet protestors have been viciously beaten and jailed. Gender: Most of the exploited garment workers are women. At the same time, human trafficking – particularly of women and girls – is a huge issue. Lack of respect for human rights and shrinking space for civil society: Activists and protestors have been viciously beaten and jailed. Restaurants, hotels and other public venues often succumb to political pressure and refuse to rent space to CSOs, making it difficult for them to organise. Proposed laws would criminalise social media posts that those in power do not like. (The official language restricts Facebook and other posts that “hinder the sovereigny and integrity” of the state.). Lack of Transparency: Three judicial laws were passed this year after just 7 minutes of parliamentary debate. No Accountability: The Royal Government of Cambodia accepted over 100 recommendations in a recent UN Universal Periodic Review, but shows no sign of implementing them. Greed and gross inequality: Companies directly linked to politicians and government cronies dominate the economy and are behind land evictions meant to free up space for condos, shopping plazas and other developments. The most recent news from Phnom Penh seems to indicate that the Royal Government of Cambodia will shelve the Cybercrime law for now, instead relying on regulation, wiretapping (of phones and the internet) and the establishment of a new ‘Cyber War Team’ to monitor social media to “protect the government’s stance and prestige”. Yet in the face of all this, the activists and families that we met remain optimistic and continually take a stand to reclaim their rights. GCAP Cambodia is participating in the action/2015 campaign, under the banner “iMove Against Corruption and Impunity”. And the international solidarity mission aims to shine a spotlight on the government actions, while advocating for positive change. What follows is the media release containing the observations and recommendations of our international solidarity mission. Keywords: Asia, Cambodia, CCC, CIVICUS , Civil society, Cooperation Committee for Cambodia, Cybercrime, Forum-Asia, GCAP, Global Call to Action Against Poverty, Human Rights, IFP, International Forum of National NGO Platforms, judicial independence, land grabs, SEACA, Trade Unions. Set against a background of endemic corruption, unsustainably low wages and impoverishing confiscations of land, Cambodia is considering a series of laws that will severely restrict human rights and the activities of civil society organisations working on these issues, according to a team of international experts visiting the country. Five new laws – on agricultural land, associations and non-governmental organisations, cybercrime, telecommunications and trade unions – are being drafted by government ministries and are expected to be brought before the National Assembly in the coming term. An additional three laws that compromise the judiciary were just adopted. The international delegation representing seven global civil society networks — the Asia Democracy Network (ADN), Beyond 2015, CIVICUS, FORUM-ASIA, Global Call to Action Against Poverty (GCAP), the International Forum of National NGO Platforms (IFP) and South East Asian Committee for Advocacy (SEACA), — met with parliamentarians from Cambodia’s National Assembly and Senate, officials at the Ministry of Justice, development partners including the World Bank, USAID and European Union, United Nations officers as well as with activists who have been beaten by security forces and families dispossessed from their land. Unfortunately, parts of the Royal Government of Cambodia do not appear to place a high value on civil society’s opinions. Officials at the Ministry of Justice said that NGOs often ‘interfere’ with government work, while on at least two occasions in the past three months, Cambodian Prime Minister Hun Sen has said that his government does not need civil society input. A new cybercrime law – that the government says is designed to prevent “ill-willed groups or individuals” from spreading false information – could criminalise individual input as well. Article 28 of the draft legislation states that people who ‘hinder the sovereignty and integrity’ of the state could be subject to a substantial fine and jailed up to three years. The telecommunications bill meanwhile will make carriers responsible for censoring content. The environment for much of civil society is already difficult. Hotels and other public venues are frequently pressured to not rent meeting rooms to activists, who note that they have also been intimidated and followed by security officers. The proposed law on associations and NGOs – which was first tabled in 2011 and is expected to be presented again to legislature again this term – would subject civil society organisations to debilitating restrictions. “The latest version of the NGO law would reportedly force all civil society organisations to register and give government officials broad discretionary powers to oversee and control their operations,” says Sarah Enees of IFP, the International Forum of National NGO Platforms. “We’re worried that this law could be used by the government to arbitrarily deny registration to organisations that are critical of its policies. Meetings with the National Assembly and Senate Human Rights Commissions offered a ray of hope to the international delegation as parliamentarians pledged to highlight violations of human rights and address the impunity of officials who are not brought to justice. Both committees expressed interest in establishing an online forum for individuals to submit grievance. The Senate Commission also pledged to address the lack of civil society participation in drafting laws. At the same time, some Members of Parliament shared civil society’s frustration with the lack of government transparency, noting that often they are also not privy to draft legislation. 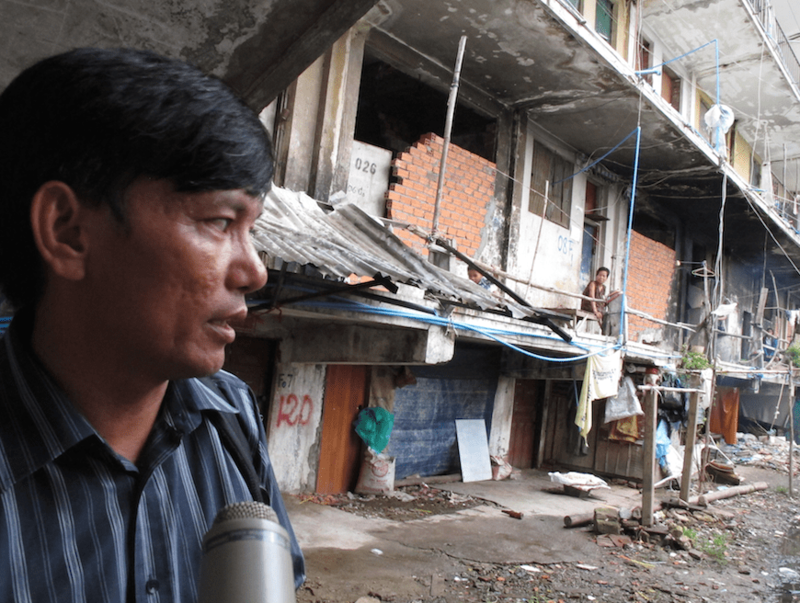 Civil society activists in Cambodia are also extremely concerned about issues of land tenure, decent work and justice. Land grabbing is a huge issue in Cambodia and the international delegation met a number of women and families whose homes were destroyed to make way for corporate developments. Just this week, a brief was filed at the International Criminal Court noting that over the past 14 years some 770,000 people have been adversely affected by land grabs in the country and nearly 150,000 forcibly transferred from the capital. The proposed bill on agricultural lands would make the situation worse, institutionalising land seizures for both corporate and state use. Cambodian workers face difficult conditions and low wages. Earlier this year, a general strike by garment workers – seeking a living wage of US$160/month – was violently suppressed. The proposed trade union law would require that 20% of workers in a given company support unionisation. By contrast, the International Labour Organisation (ILO) says that there should be no threshold. The three judicial laws recently passed by the National Assembly, after seven minutes of debate, will compromise the independence of the judiciary by providing the executive branch of government, via the Ministry of Justice, with control over the courts’ finances, personnel and general administration. Details of the laws’ implementation have yet to be worked out and the Ministry of Justice will hold an Dissemination Workshop workshop later this year to discuss implementation. They said the workshops will also provide an opportunity for proposing amendments to the three laws. Members of Parliament in the National Assembly and Senate agreed to the need to review these laws. We hope that the Royal Government of Cambodia will revisit these laws before they are implemented. 1. Create a safe and enabling environment for civil society and human rights defenders in line with its international and constitutional human rights obligations as well as the commitments it has undertaken through the United Nations Universal Periodic Review. 2. Promote significant and systematic stakeholder and civil society consultations on all legislation, including the five laws mentioned above, and should only place laws before parliament after these inputs have been taken into account. 3. Adopt and implement a law on the process for drafting legislation. This law should include provisions to instituationalise mechanisms for public input, public consultations and structures for civil society interaction and to integrate this input into new drafts. Government ministries and other state institutions should be legally required to publicly disseminate draft laws, regulations and policies and to organise public consultations and invite comments from the public on these items prior to submission to the Council of Ministers. Civil society and public consultations should begin when laws are first being drafted, not only when they reach parliament. 4. Adopt and implement a law on Access to Information. This should take precedence over the adoption of the five laws mentioned above. This law should also create a pubic database with information on the scope, scale and details of land transfers and sales. 5. Immediately revisit the three judicial laws to rewrite and remove provisions that threaten the independence of the judiciary. 6. Allow trade union activity and do not require a 20% threshold to establish a trade union. All workers, including civil servants and members of the informal economy, should be able to unionise. The Trade Union law should comply with ILO best practices. Ensure that all Cambodian workers receive a living wage. 7. Respect and ensure the freedom of online expression. 8. Establish independent investigations into arbitrary arrests and the excessive use of force against protestors and human rights defenders. The authorities must also cease the use of violence and lethal force at peaceful demonstrations and not take actions that threaten or intimidate activists and journalists. 9. Rapidly create an independent national human rights institution in conformity with UN guidelines including, the Paris Principles. 10. Establish online mechanisms in the National Assembly and Senate Human Rights Commissions for individuals to submit human rights grievances and for these submissions to be recorded and reviewed.